Cast: Will Ferrell, Christina Applegate, Paul Rudd - and Tim Robbins, bizarrely. Story: Brash comedy, a chauvinistic 1970s news team is joined by a beautiful ambitious woman. Anchorman: The Legend of Ron Burgundy is one of those movies that you just know the cast had a great time making. It has an air of ease - as if the cast and crew showed up each day and did whatever they fancied, with enough inner confidence to assure themselves that it'd be good no matter what they did. In a way that's good, because it creates a feeling of naturalness and daftness, but it also means it's not actually very funny. It's amusing, in a fun kind of way, but it creates titters instead of guffaws. Will Ferrell does his usual Saturday Night Live routine and is boosted by small appearances by the usual suspects Ben Stiller, Luke Wilson and Vince Vaughn - even Tim Robbins pops in (though oddly he's not in the credits), but as we haven't seen him do unsubtle comedy before, he seems misplaced in this setting, reminding me of the weekly uncomfortable celebrity guests in The Muppet Show. A more Leslie Nielsen-esque part would have suited him better. Steve Carell generates most chuckles as unhinged weatherman Brick Tamland, though Jack Black (again uncredited) gets the single biggest laugh for his way of dealing with Ron Burgundy's dog. Paul Rudd (Phoebe's husband in Friends) goes for a straighter performance and appears vegetarian compared with the deliberate hamming of the rest of the cast. Christina Applegate who, incidentally, seems to get more attractive with every passing year, fills Veronica Corningstone's shoe collection as well as anyone would, but it can't exactly have been a challenging role. There's not much more to say about Anchorman. It's light silly fun, there's nothing much to dislike, but it's very similar to many other movies. 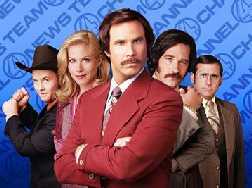 If you liked Old School, Starsky and Hutch, Elf and so on, then you'll like Anchorman. If you haven't seen any of those, then I recommend renting it with a few guys who enjoy daft films, picking up a few tinnies on the way back from the video shop and giving Domino's a bell. If that doesn't sound like your kind of evening then Anchorman probably isn't your kind of film either. Testosterone Satisfaction Rating: 1/5 Just some 1970s political incorrectness. To enjoy this film you should be: feeling silly.